Here's something you don't see real often. 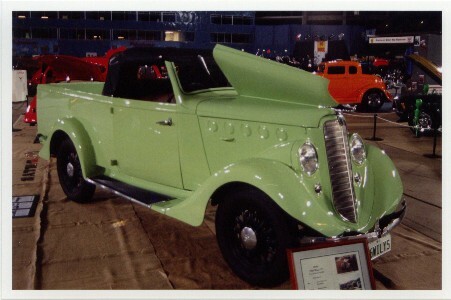 A '36 Willys ute! 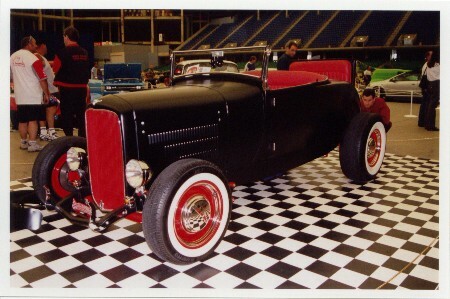 Brett Paige liked the ZZ Top car so much he went and built himself one. The only difference I think is the fact that this one is probably better! 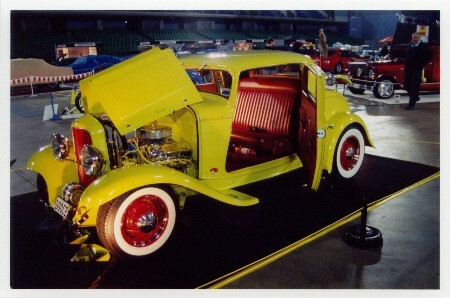 It now resides in New South Wales and does get driven to the odd show and shine. 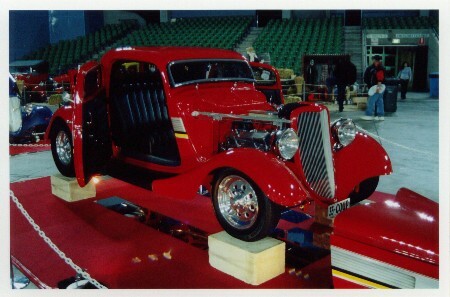 This cool looking sedan was put together by Mick Ogle. 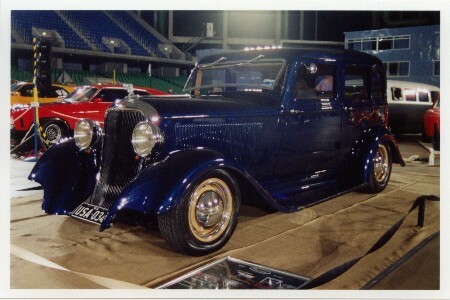 It's actually a '34 Plymouth body with a Dodge grille and fenders. Mick has dubbed it the "Plodge". It sits nice and low thanks to a complete Jaguar suspension. The continental kit is off a late model Japanese 4WD. If you're a keen observer you would have also noticed the VW taillights. 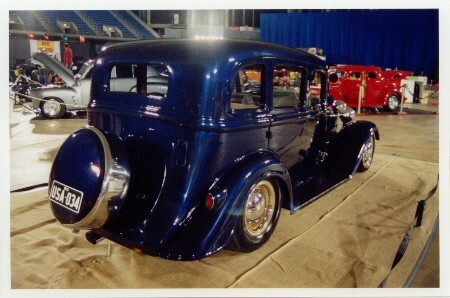 Peter Hunter's Deuce 3 window now sporting wire wheels and whitewalls. The first time I saw it it was sporting red solids, then Peter put Halibrands on and now these. The show opens to the public on the Saturday morning, so off I headed with a mate of mine. 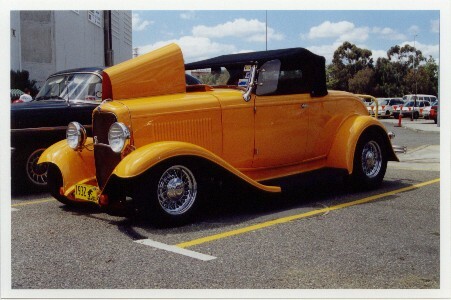 In the car park was organising committee member Roy Whitchurch's '32 roadster. Two of Perth's oldest Hot Rods. 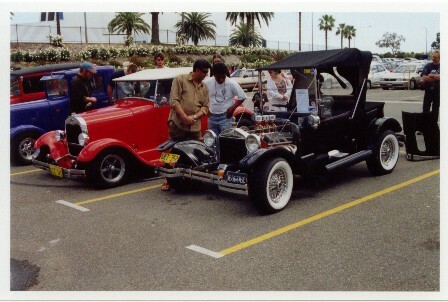 Neil Gibb's T bucket and Alan Barton's '29 roadster. Between them, these two cars have done more miles than some Perth Taxis. Perth's latest "rat rod". Well hardly... very nice satin paint and all nicely finished. 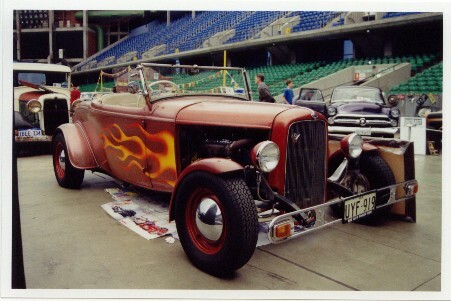 This IS Perth's oldest Hot Rod. This channelled roadster was originally built by Vince Berriman and was first registered in 1967 I believe. It has been continuously registered since then.